All smokers looking for a container to keep your tobacco fresh, end your search right now and acquaint yourself with the Medtainer! The Medtainer is an on-the-go, compact container for those who want to carry their medications and legal herbs without attracting too much attention. At first glance, the Medtainer simply appears to be a standard prescription vial. 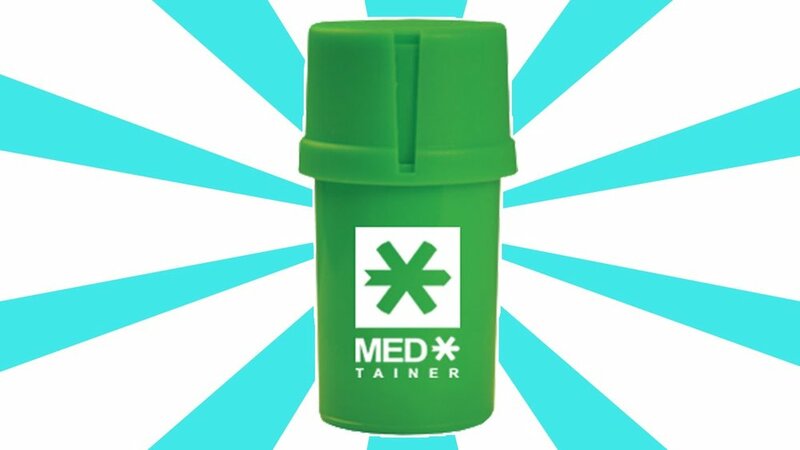 However, upon closer inspection, the observer will note that the Medtainer distinguishes itself from a regular pill bottle with a built-in grinder. Now you can save space and preserve your tobacco. For those who are concerned about keeping their tobacco extra fresh, The Medtainer’s got you covered with a twist-and-turn cap that keeps the container not only airtight but also waterproof—your tobacco will never be stale or soggy! What’s more, the container itself is designed from plastic, so you won’t ever have to worry about it breaking. These discreet yet handy features are surely indispensable to all smokers looking for a good place to store their medications and herbs while on the go. In short, the Medtainer is cheap, convenient, and compact. What more can you ask for, really?